I learned to homebrew back in graduate school. At first, I used bleach as a sanitizer because it was cheap and effective. Later, as I became aware of bleach’s potential to cause off flavors (and pit stainless steel), I switched to iodophor and later Star San. In my lab, however, as in biology labs worldwide, there was a sanitizer I used almost every day — 70% ethanol (sometimes written 70% EtOH). It didn’t occur to me until recently that this could be used in a brewery. Ethanol, combined with a little water, is an effective sanitizer. Scientists have figured out that it is most effective at a concentration of 70% ethanol (v/v, with the remaining 30% being water) — although it is almost as effective throughout the entire range of 40–95%. The water helps the ethanol penetrate bacterial cells better. In biology laboratories, 70% ethanol is most often used to wipe down lab benches. (Glassware is generally sterilized by being autoclaved.) When sprayed on a clean surface, it kills bacteria in a manner of seconds. Ethanol is not a contact hazard. In fact, many hand sanitizers are alcohol based. And, if you pour off any excess solution, you don’t need to rinse vessels that have been sanitized with ethanol. And, to top it off, ethanol is fairly cheap. 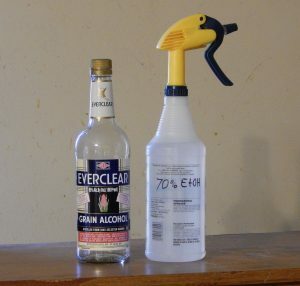 You can easily make a 70% solution from Everclear (which, at 190 proof, is 95% ethanol) and water — just mix 7.37 volumes of Everclear to 2.63 volumes of water. You could also slightly dilute a 151 proof (75.5% alcohol) distilled spirit (such as rum) slightly, although this would likely have a flavor. At this point, one thing you might ask is, if 70% ethanol is so great, why don’t breweries it? Two words: “ka” and “boom.” Some breweries use isopropanol to spray fittings, but ethanol isn’t used a sanitizer because ethanol is flammable and ethanol fumes are volatile and explosive. In addition, although ethanol is fairly cheap, other sanitizers are cheaper. And when you need lots of a sanitizer, the costs add up. At home, there’s no reason to abandon iodophor or Star San as your primary sanitizer. However, in a homebrewery, 70% EtOH can be an excellent backup. It’s great for wiping down work surfaces (its primary use in biology labs) — something you wouldn’t want to with iodophor, because it stains. It evaporates quickly, leaving the surface sanitized and ready to go. And in a pinch, it can stand in for any of the usual sanitizers. I would avoid sanitizing carboys (or any enclosed container) with ethanol, as they could explode if exposed to a spark. I wouldn’t worry about that with an open bucket, or for sanitizing loose items, but I would keep flame away. If you brew in your kitchen, a spray bottle of 70% EtOH can be used for quickly wiping down (clean) countertops, rendering them sanitary. If you brew outside, it can be used to sanitize almost any non-porous surface, including workbenches or metal shelving. I sometimes cover surfaces outside with aluminum foil, then sanitize that surface as a place to lay sanitized items, such as stoppers or fermentation locks— before they are used. Likewise, a spray bottle of no-rinse sanitizer can be great for “touching up” items that were sanitized, but may have briefly contacted a non-sanitized surface. For example, if you’ve sanitized your racking cane, but accidentally touched the cane in a location that will be under the surface of the wort. Seventy percent alcohol won’t replace your main sanitizer, but it never hurts to have a backup. If you enjoy Beer & Wine Journal, please consider supporting us by purchasing one of my books, which include “Home Brew Recipe Bible,” by Chris Colby (2016, Page Street Publishing) and “Methods of Modern Homebrewing,” by Chris Colby (2017, Page Street Publishing). Both are available online though Amazon (linked) and Barnes and Noble. You can also find the nearest independent bookseller that carries them through Indiebound. You can also support this website through the donation button. Thank you. One reason I already use it is because it takes away odors from my plastic containers very nicely after fermentation. Chris, Can you use methylated spirits as a sanitiser? It would sanitize surfaces however it is toxic to consume and is an industrial alcohol (not food-grade). You would need to rinse well with boiled water afterwards. It usually has several additives to discourage consumption. Plus, being produced for industrial purposes, the purity is not the same as everclear/grain alcohol/vodka and could contain industrial oils, benzene, or other contaminants. 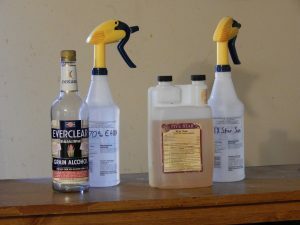 I’ve been waiting for an opportunity to share my ethanol trick… Swirl/shake about 50 mL everclear in a glass carboy or keg, stick one of those bendy-extension lighters into the mouth and move your hand QUICK! Flame sanitizes and purges some O2. PLEASE BE SAFE IF YOU TRY THIS! I torched my hand pretty badly the first time when I didn’t use the bendable lighter. Best to do it in the dark since it looks amazing AND since etOH burns so clean, it can be tough to tell if there is still a bit of flame lingering at the mouth of the vessel. Any thoughts on using 70%EtOH to spray down the outside of an oxygen stone? I assume that, as long, as there is not an open flame it would be okay.